My son has this bubble on his upper gum. Should we take him to his doctor or dentist? The bubble on your son’s gum is a mucocele. 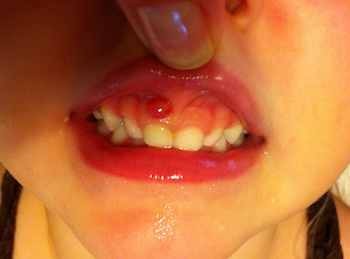 These oral cysts occur as a consequence of trauma to a salivary gland duct. While not“common”, I probably see one or two a year. Mucoceles do not cause problems, but they do not disappear on their own. Mucoceles will often rupture spontaneously and appear to resolve. Unfortunately they typically reoccur and require surgical excision. While not an emergency, take your son to his doctor. He will likely need a referral to an ENT or Cranio-Maxillofacial surgeon.